We have, understandably, been spending a lot of the past few months taking our weekends a little slower than usual. I typically have to use our weekends as time to get projects and shoots done for the blog and some freelance clients, so I’ve been trying really hard to condense my weekend work to Saturdays to leave Sunday open for some true downtime. As a result of being a bit more successful at this division of work and rest, we’ve been having some really nice Sundays, camped out on the couch with the fireplace crackling, and usually some football games on TV. 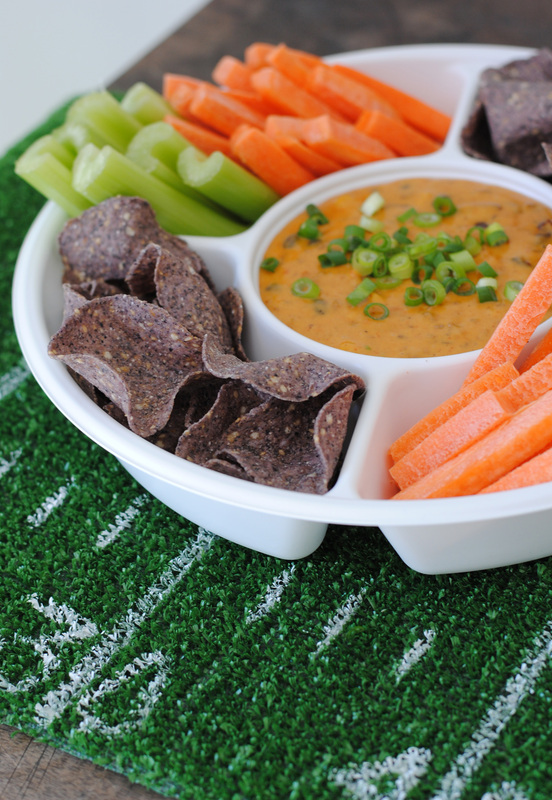 Truthfully, I only half-watch the games, but love what comes with it – hanging out with my husband and game day snacks (he and food are my two greatest loves). 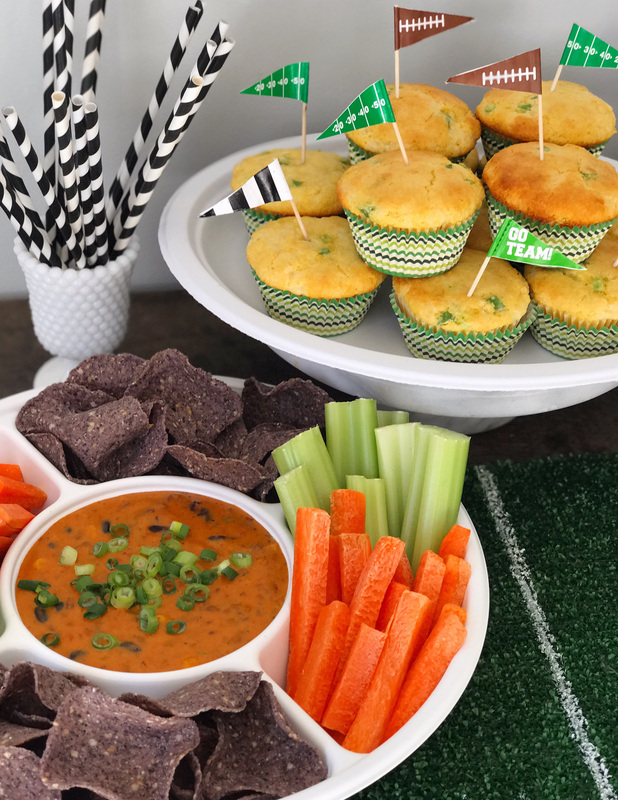 As the season winds down, I’ve been brainstorming some fun ways to bring a little #domestikatediy detail to football viewing traditions because I’ll jump at any chance to turn a relaxing Sunday activity into a party! 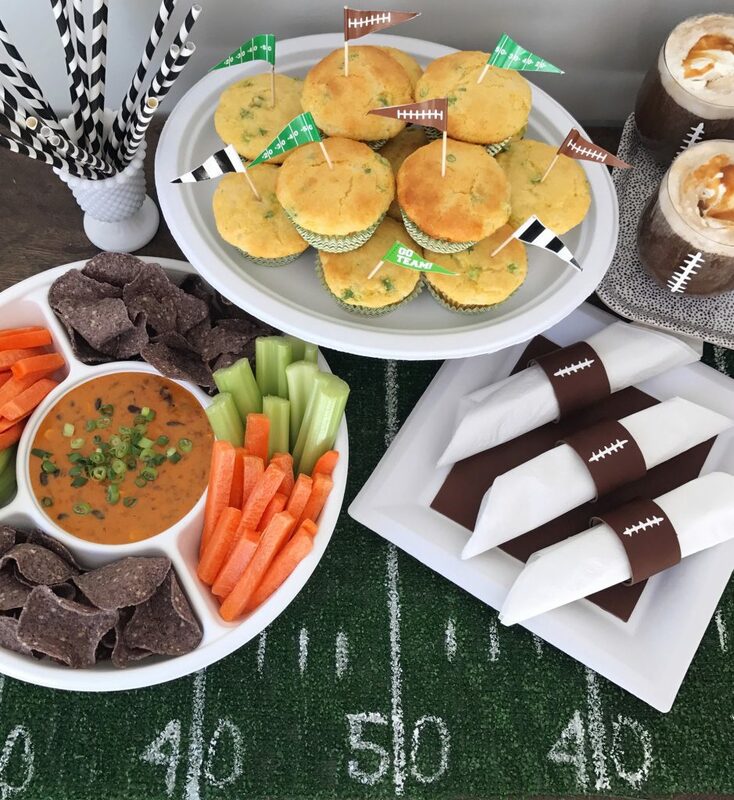 Below are a few fun ideas for how to step up your entertaining game when hosting friends for the big game! Bring in fun details. 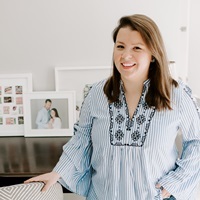 When I’m entertaining, my first order of business is always to think about how to bring in fun, theme-appropriate details to dress up a tablescape, bar or buffet. 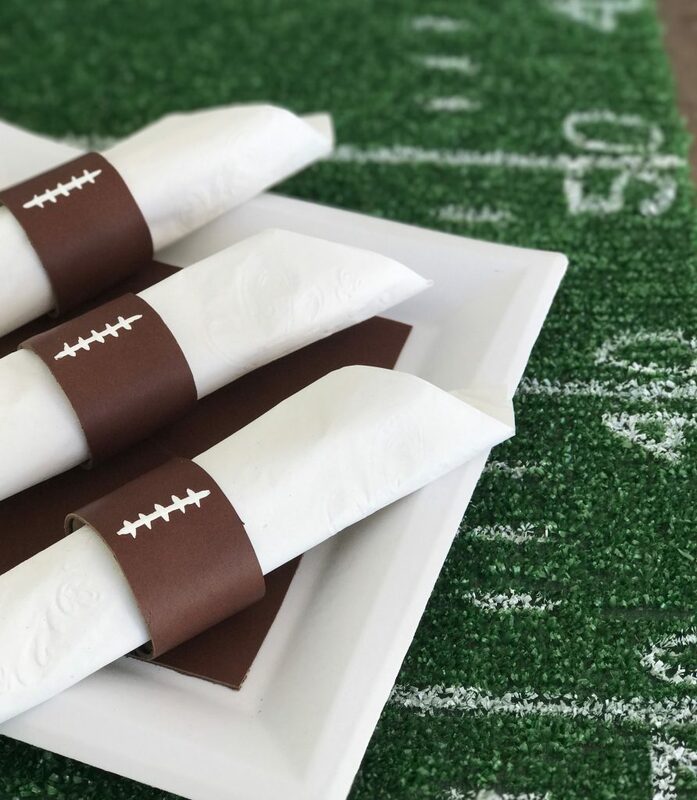 Since football viewing is typically a casual event, I set up a snack buffet on top of a homemade “football field” table runner made out of AstroTurf (did you know you can buy sheets of this on Amazon?). I cut the AstroTurf to size, and using a little bit of white paint, drew on the yard lines and numbers to make it look like a field. Another fun detail I added was DIY football napkin rings. To make them, I took cardboard paper towel rolls and cut them to the size that I wanted to fit my Chinet® Classic White™ napkins. Then I wrapped the cardboard rolls in a small piece of brown leather (look at your craft store for sheets of this!) and secured the leather with a bit of glue. A small binder clip held them in place while they dried, and I finished them off with white paint to look like the laces of a football. 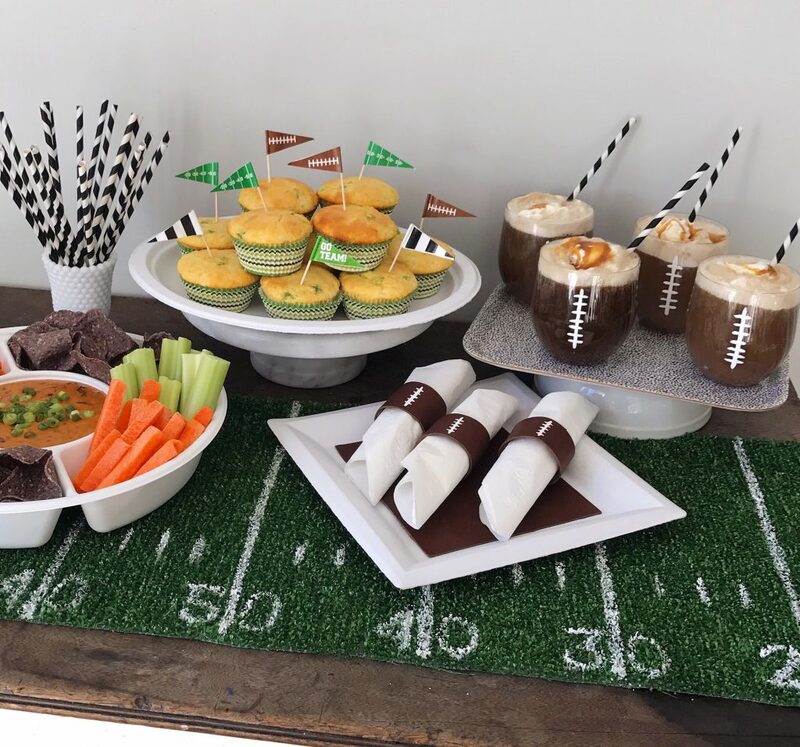 A few other fun details to bring in to dress up your table: festive toothpick flags rooting on your home team to add to snacks on the table, and black and white striped straws to mimic referee uniforms! Set the table (and prep for cleanup!). One of the challenges of throwing a big football party is the game usually happens on Sunday night. The last thing you want to do after hosting a big party is doing a massive cleanup before you go to bed and head out to work the next today. So for a football fête, stock up on sturdy, disposable neutral white dishes and napkins like the Chinet® Classic White™ collection. 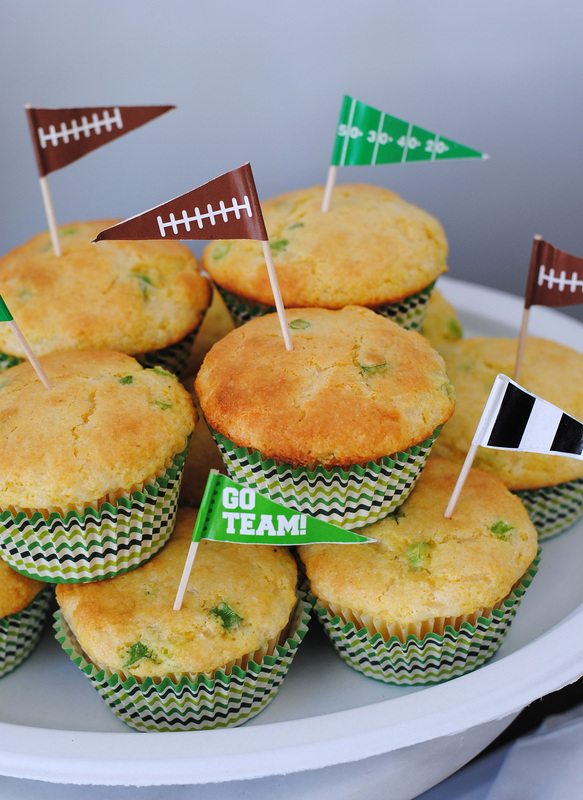 They’ll mix well with the football-themed details, and they make for an easy cleanup! I like to set out bins for plastic and paper ahead of time so they’re easy to sort and recycle. Go big with appetizers. Appetizers are usually the highlight of a football watch party for me. 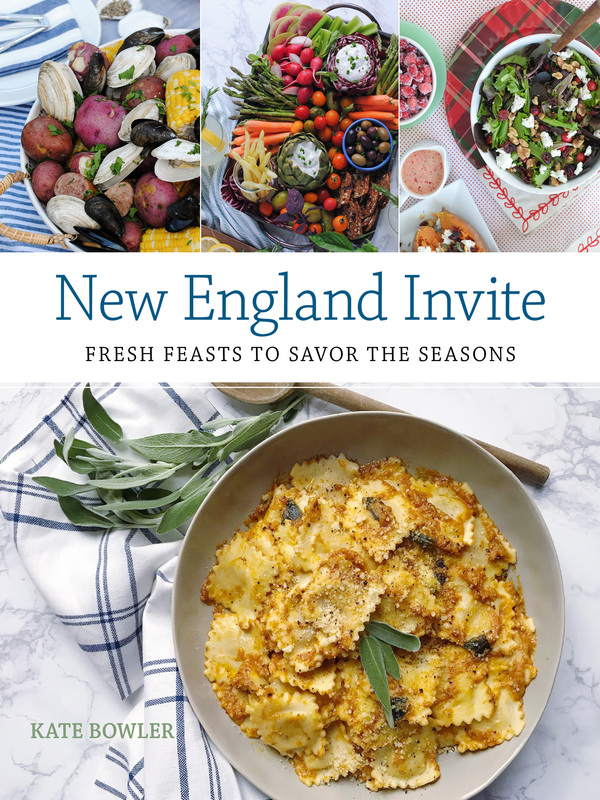 A few of my favorite past recipes: football-shaped Rice Krispy treats; crispy buffalo Brussels sprouts; a shallot and leek party dip, and savory stuffed garlic knits. This year I’ve also been testing a recipe for an easy chili-cheese dip that I’m going to introduce this year. It’s so simple: over low-heat, combine 2.5 ounces of Velveeta cheese with 1 cup of chili (use my chili recipe to make this ahead of time and serve at the party as your main course!). 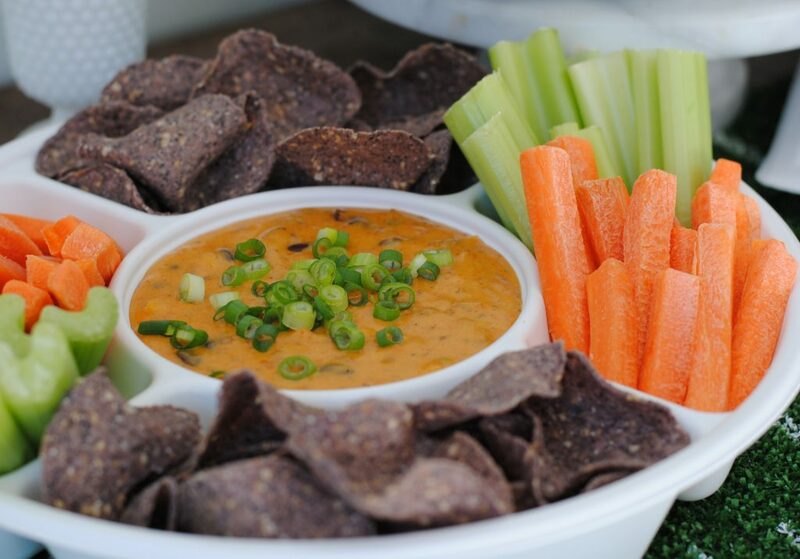 After it heats and combines, serve it while hot in a Chinet® Chip & Dip Party Tray with dipping sides like blue corn chips, carrots and celery sticks! Mix up the main event. It’s not a football party without a homemade chili bar, which is one of the easiest things to set up! Serve your chili in a crockpot to keep it warm and lay out all of the toppings in small bowls to let guests fix up their own bowl. Serve it with a special side, like a cheddar scallion cornbread muffin. I use a box mix for classic cornbread muffins and then stir in ingredients like bacon, sharp cheddar or Monterey Jack cheese, fresh scallions, or even whole corn kernels to mix up the flavor and texture. Display them almost like a savory cupcake, with festive flags on an oval platter. End with a sweet treat. Every party needs a sweet treat, and I mixed up a batch of classic root beer floats with vanilla ice cream and a drizzle of caramel sauce (add some sea salt on top, or spike them some bourbon cream liquor for adults!). 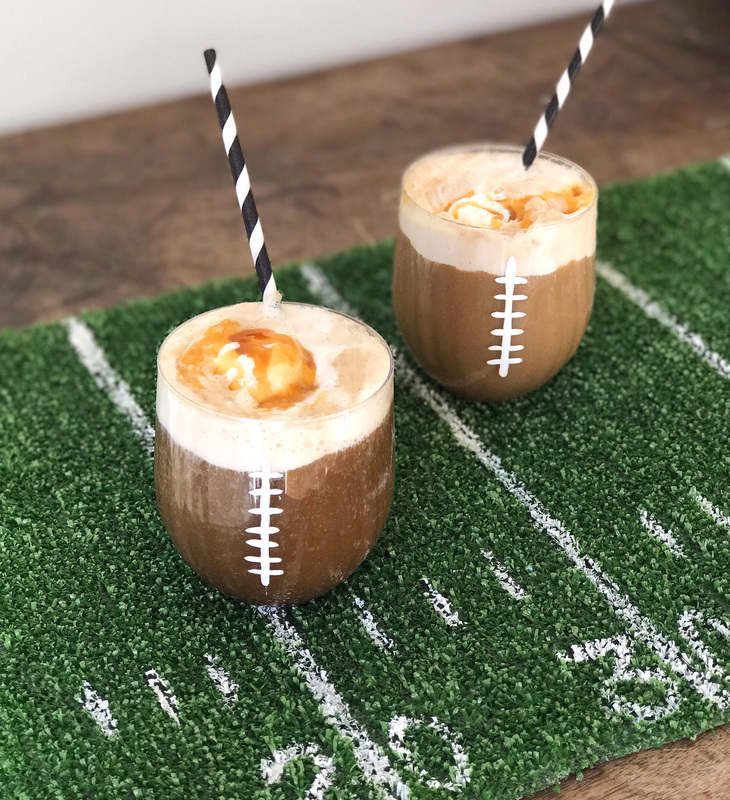 Keep them on theme by painting white laces on disposable Chinet® Cut Crystal® stemless wine glasses—when you fill them with root beer they’ll look just like little footballs! 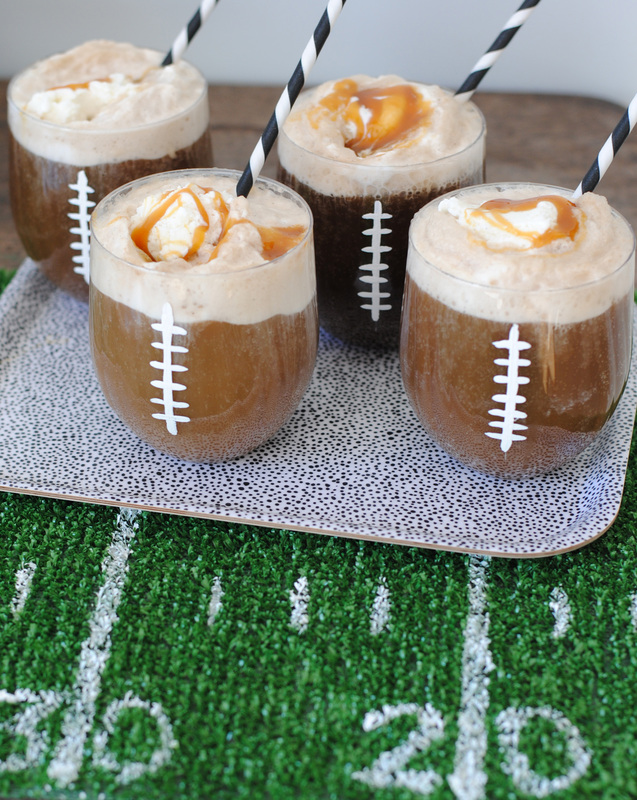 It’s the perfect football-themed treat to cap off the night. Crispy Buffalo Brussels Sprouts. Staying Hydrated with Citrus Infused Waters.